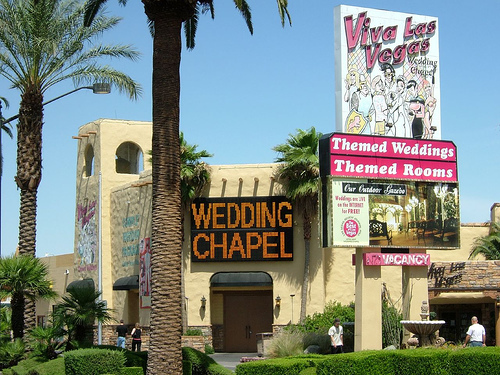 The world famous Viva Las Vegas Wedding Chapel is only a few minutes drive from the world class hotels and casinos. Our Elvis wedding chapel has been open and marrying couples for 20+ years and without a doubt is “the Original” Elvis Wedding Chapel in Las Vegas, our chapel has some amazing packages as well as a choice of our themed wedding chapel, our beautiful outdoor wedding gazebo or our breathtaking garden wedding chapel. We are known throughout the world as most the famous Elvis wedding chapel and our wedding packages reflect a multitude of different options such as our blue Hawaiian wedding or our favourite the hound dog wedding, along with renewal of vows ceremony packages starting as low as just $150. Many many couples wish to take advantage of our beautiful outdoor areas as well as our large well appointed wedding chapel, with this in mind we also offer all of our beautiful wedding chapel venues as weddings with your choice of ministers. We are proud to offer some of our most famous wedding packages and renewal of vows packages from as little as $150 for the full wedding. Owning and running one of the most famous chapels on the Las Vegas strip is an honour and a pleasure, being in a position to bring such happiness to literally thousands and thousands of couples each year is the most rewarding part of the business. I am proud of the service that we offer our brides and grooms together with our fabulous packages that will make their wedding in Las Vegas go for a memorable and fantastic experience. Of course being able to dress up as the king himself for weddings is definitely a massive perk. If you are coming to Las Vegas to get married and are looking for an Elvis wedding Las Vegas then please give us a call or pop in and see us. Las Vegas is the world capital of weddings and has more weddings taking place each year than any other place on the planet. Here are some interesting facts about weddings in Las Vegas. We are always on hand to assist you with your wedding plans in Las Vegas, so please feel free to call one of our experienced Las Vegas Wedding Planners to discuss your wedding requirements.